I read an absurd number of books in July (28, as of Tuesday night) and have reviewed exactly one of them. Not an impressive statistic. Next week I ought to avoid the library and focusing on reviewing at least a few of them…but that’s a problem for next week. 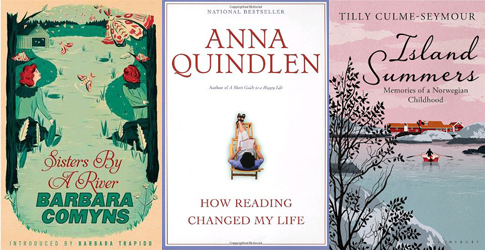 How Reading Changed My Life by Anna Quindlen – a long essay (and very short book) about how reading has shaped Quindlen’s identity and life. Highly quotable (expect excerpts soon) and highly defensive of middlebrow literature (hurrah!). Island Summers by Tilly Culme-Seymour – This memoir about three generations of women and their summers spent on the family’s small Norwegian island was on display in every bookstore I visited while in the UK and, knowing that it wasn’t coming out in North America until late September, I itched to buy it. I restrained myself and was then rewarded by discovering that the library had purchased a digital edition already. The Family Man by Elinor Lipman – A hysterical phone call from Henry Archer’s ex-wife and a familiar face in a photograph upend his well-ordered life and bring him back into contact with the child he adored, a short-term stepdaughter from a misbegotten marriage long ago. 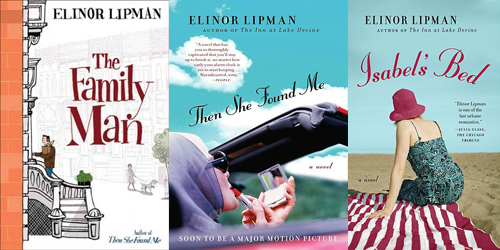 Then She Found Me by Elinor Lipman – Given up for adoption thirty-six years ago, April Epner, now a quiet-living, sensible-jumper-wearing Latin teacher, has never had the slightest desire to be reunited with her biological mother. But, as it turns out, she doesn’t have a choice. Isabel’s Bed by Elinor Lipman – Isabel Krug is a glamorous blonde with a tabloid past; Harriet Mahoney is a bookish single would-be writer, unlucky in love, who never takes risks—except one. After hearing about Margery Sharp for years from other bloggers, I finally tracked down a few of her novels via inter-library loan. I’ve been meaning to read a second Margery Sharp ever since I read my first, in 2002 or thereabouts. Maybe you will spur me on! And hurrah for Comyns! I do hope you’ll like her… I have the added joy of knowing the village she is describing in Sisters, as my dear friend Lorna grew up there. I’m not sure what I’m going to think of Comyns’ style, but I am excited to find out. Of all her books, this is the one that sounded the most appealing to me and I have to say that its slim size is very encouraging. I never read the Miss Bianca books (had never even heard of them until I saw other bloggers reading her adult books) but almost everyone who has read Sharp, either as an adult or child, seems to have good things to say! Hopefully it will be the same with me. Wonderful to hear, Susan. I am excited to start reading it. The Quindlen book is lovely (though I think the essay you’re think of on marrying libraries comes from Anne Fadiman’s fabulous Ex Libris, one of my favourite bookish books). And happy to hear that you’re enjoying the photos! Hope the chaos around you settles soon. Yes, it is exciting, isn’t it! I’d been wanting to read her for years but the Vancouver library doesn’t have any of her adult books: thankfully, the Victoria, New Westminster, and Peace River libraries came to my rescue. I love ILL! Have always wanted to read Margery Sharp, thanks for the encouragement. Just finished A Glass of Blessings by Barbara Pym. This was a second reading and really enjoyed it. I’m looking forward to trying Sharp myself, after hearing so much praise. She sounds like someone whose books I’ll love. I’ve had mixed reactions to Pym in the past (adored one book, couldn’t finish another) but haven’t tried A Glass of Blessing yet. Shall have to do so one day! I’ve not heard of Margery Sharp and while I’ve heard of Lipman, have yet to read any of her books. So definitely adding to the to-read list here! I know. It is ridiculous but with long days and some very easy (too easy) book choices I’ve just been flying through them. You MUST read Lipman! She is so fun and smart and just properly delightful. When I used to visit our library, many years ago (I tend to buy my books now, they’re so cheap on Amazon) there were always Margery Sharp books on the shelves but I never read them! It will be interesting to hear what you think of them. As for myself, I’ve just bought Rutherford Park by Elizabeth Cooke. Now, this writer isn’t exactly new to novel writing. She penned several under her name of Elizabeth McGregor and very good they were, too. Rutherford Park, it has been said, will appeal to lovers of TV’s Downton Abbey. Furthermore, I’ve just heard from Amazon that Charlotte Betts’ 3rd novel set during the time of the Great Fire of London, The Spice Merchant’s Wife, is now on its way to me. Yippee! 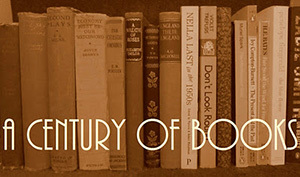 A surfeit of super books, what! Unfortunately, my library doesn’t have any of Margery Sharp’s adult books, which is why it has taken me this long to get around to reading them. Thank goodness for inter-library loan. As cheap as some books may be online, free is better! Hope you enjoy Rutherford Park!